Well, it’s here. Tesla Inc.’s $35,000 Model 3 went on sale Thursday afternoon in typical fashion: teased on Twitter, announced by CEO Elon Musk and a bit late (it was first unveiled just shy of three years ago). The car has a totemic significance for the company, representing the break-out moment from luxury Silicon Valley toy to electrified wheels for the masses. I went on the website and was told the base model – with cloth seats and “basic audio” – would cost me $35,000, or just over $29,000 after federal and New York subsidies (it also said gasoline savings bring the true cost below $25,000, but come on). More than 12 years after Musk published his Secret Tesla Motors Master Plan, his “even more affordable car” has arrived. So why did the stock drop in after-hours trading? Because this crowning moment came with more than a hint of a gamble. So, yeah, we expect to introduce the standard-range Model 3 sometime probably in the middle of this year is a rough guess. Clearly, the timetable has accelerated. Yet how to do so profitably? 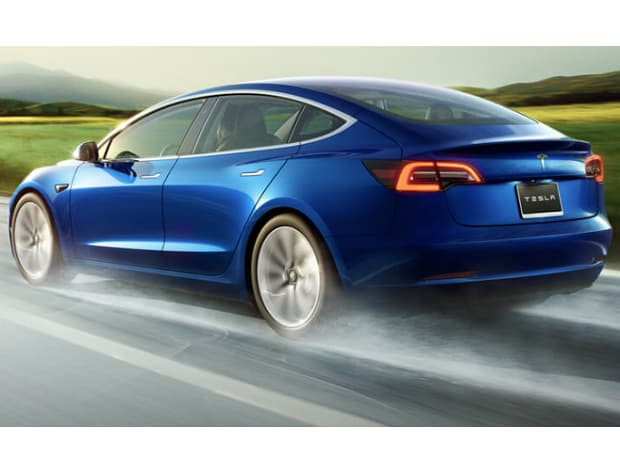 On the same call, an analyst had asked what the current price differential was between a battery pack and powertrain for an electric vehicle and a regular car with an internal combustion engine. Musk estimated it was “probably on the order of $7K, but trending towards $4K or $5K.” How much of that gap has been bridged in the intervening four weeks? A clue comes in the form of other announcements made on Thursday. Musk effectively downgraded his earlier optimism about Tesla eking out a profit in the first quarter, as expressed a month ago, to saying he didn’t expect this quarter to be profitable but that the next one was likely to be. The real bombshell, however, was the news that Tesla would switch global sales to an online-only model, with many of the company’s sleek stores closing. Again, there is something radical and intriguing about this, with Tesla saying prospective customers will be able to take a car for seven days and return it if unwanted and that more servicing will happen at the customer’s location, saving them the trouble of traveling to it. Jury’s out on how many people will want to order a $35,000 car from their phone, but still. And yet … more job cuts? Only a month ago, Musk boasted Tesla had opened 27 new stores and service locations. Like his original estimate of the new Model 3 appearing mid-year, this is a major pivot in the space of a few weeks (the same goes for the company’s solar-power business). Meanwhile, prices across the range have been cut again. Along with the tight capital expenditure budget, it adds to the dissonance between the narrative of unquenchable demand and growth supporting the valuation and what looks like an all-out effort to boost sales in short order and slash the cost base. Does Tesla need to cut the cost of the Model 3? Absolutely. Stripped of context, therefore, Thursday’s announcement ought to be a victory lap of sorts. Yet it comes, suddenly, just ahead of a $920 million convertible-bond payment and at the end of a couple of weeks that have reiterated the peculiar risks attached to the company and its CEO. All the noise and vibration is killing the thrill.